Try them! Try them!And you may. I will try them. You will see. Say! I like green eggs and ham! And I would eat them in a boat. 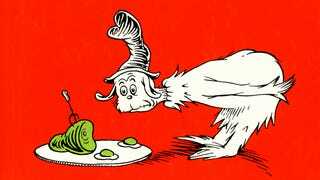 Upon a thorough and detailed analysis of Dr. Seuss' seminal work, Green Eggs and Ham, I have come to the conclusion that it explores feelings of reticence in trying new things, but upon summoning the courage to do so, the joy of discovering a new delight results in gratitude toward the entity encouraging one to try it in the first place. So to apply this lesson in real life, it may be advisable to actually try something before spending 21 hours talking to an empty room about how much you don't like it. Or if you do, maybe avoid reading a story that is about the exact opposite of that.